Sixth edition of the ICO Nations Cup competition’s Final tournament was played this weekend in Slovenian capital-of-beer city Laško. 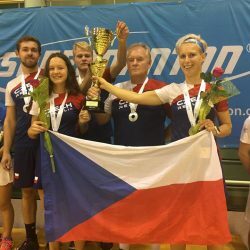 Four nations – France, Slovakia, Czech Republic and Slovenia – were battling for the glory and it was Czech Republic that took the winner’s trophy home. 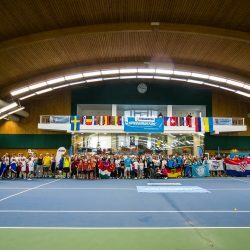 Czech Open (1000 pts) welcomed 203 players from 15 nations (Czech Republic, Slovakia, Slovenia, Poland, Hungary, Serbia, Croatia, Belgium, Germany, Russia, Latvia, Lithuania, Ukraine, Sweden, Switzerland). Masters was played on 13 courts for adult categories (Saturday from 3 p.m. 19 courts) and 12 courts for younger categories on Sunday. The lunch and refreshments was prepared for all players. Semifinal and final matches had head empires and line empires. Winner in each category received the medal, a cup, protein from tournament sponsor WE FOOD and the crossminton racket BLADE PM. For the finalists and semifinalists the medals and protein were prepared. In Open Division and Female players won price money. 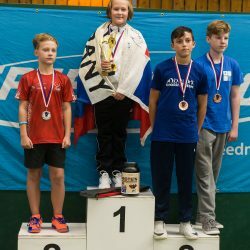 Brno hosted the Youth European Championship 2018 at the end of September. 42 players from 11 nations (Czech, Slovak, Hungary, Latvia, Germany, Serbia, Slovenia, Croatia, Belgium, Lithuania, Poland) were fighting for European titles in 5 categories. The tournament was played on 10 crossminton courts in a Tennis and Badminton sports arena Sprint in Brno, Czech Republic.